For a comedian with a highly controversial brand of humor, Dave Chappelle is pretty successful and somewhat a legend. He was shot into fame by the Comedy Central program Chappelle’s Show which became a hit in the year 2000 and continued through 2006 and ever since has evolved into filmology and won a couple of awards including Grammy for his remarkable efforts in the entertainment industry. His full name is David Khari Webber Chappelle the Afro American comedian was born on the 24th of August, 1973. When his parents separated, David spent his childhood in Silver Spring Maryland and Yellow Springs, Ohio with both of his parents intermittently. He has 2 siblings and 2 half siblings as well as step-siblings. People who knew him as a child noticed the young David’s sense of humor predicted he would eventually have a career in comedy were not wrong at all. At the age of 14 he began the pursuit of his career as a comedian after graduating from Duke Ellington School of Arts in Washington in the year 1991, he relocated to the city of New York. This was after an unpleasant ordeal of being booed by audience earlier on September 19, 1990, when he appeared on an episode of ABC America’s Funniest People Comedy show. This ordeal instead of discouraging him further strengthened his resolve to become a comedian. He made his first appearance as an actor in Mel Brook’s comedy movie Robin Hood: Men in Tights, where the played the role of Ahchoo in the year 1993. Chapelle also featured in the 1994 edition of HBO special Comic Relief. The budding comedian co-starred in Buddies and played a brief role as Reggie in 1996. Again, Chapelle played a minor role in the 1997 blockbuster Con Air. He co-wrote a comedy-drama Half Baked with Neal Brennan 1998; this was the first movie where he landed a major role. He also appeared in movies like You’ve Got Mail and Woo. When Dave Chappelle lost his Father in 1998, he returned to Ohio after a brief pause, he released a successful comedy special tagged Killin’ Them Softly in 2000 and another movie Undercover Brother in 2002. Chappelle’s career went from landing small roles in movies and live stand-up comedy until 2003 when he began his own show on Comedy Central called Chappelle’s Show. The show became popular and won two Emmy Award nominations. However, the show caused quite a stir as it frequently addressed matters bordering on racial relations. Media big shots like Oprah Winfrey made appearances on his show which earned him an additional $50 million deal with Comedy Central for two years. Before the show saw its third season slated for May 31st, 2015, Chappelle stunned his fans by unceremoniously boycotting the show and taking a trip to South Africa. Dave Chappelle afterward stated his displeasure at how the program was being directed which led to his withdrawal. Before the comedian disappeared from the spotlights for several years, he produced the documentary Dave Chappelle’s Block Party a film directed by Michel Gondry. The one-time humor maker, David Khari Webber Chappelle was born to William David Chappelle III and Yvonne Chappelle Seon. Both of his parents were professors at Antioch College, Yellow Springs, Ohio and Howard University respectively. His mother also taught at Prince George’s Community College and the University of Maryland and worked with the then Prime minister of Congo Patrice Lumumba. When his parents separated, David spent his childhood with both of them intermittently running back and forth in Silver Spring Maryland, with his mother and Yellow Springs, Ohio with his dad and his stepmother Joan M. Evans Chappelle. He has 2 siblings, an elder brother William S. Chappelle and his younger sister Felicia a.k.a “Flea” Chappelle Jones. The comedian’s stepmother had 2 children from her previous marriage named Brian and Jennifer Evans while his half-sister and brother are named Fatimah and Yusuf. Dave Chappelle is married to Elaine Chappelle (nee Mendoza) who was born in Brooklyn on the 31st of August 1974. Elaine Chappelle is a Filipino. They met in Brooklyn and dated for a while before they got married in 2001. 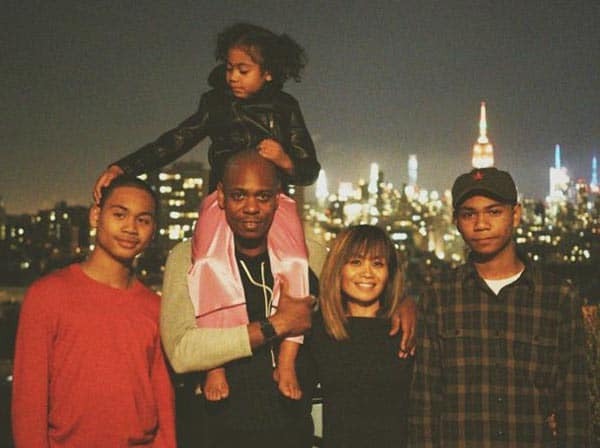 The Chappelle couple are blessed with two sons, Sulayman and Ibrahim and a daughter named Sonal (The Afro American comedian converted to Islam in the year 1998 hence the name of his sons).